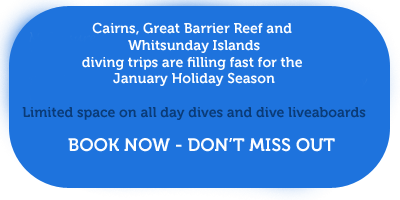 This is a review of Whitsundays Australia scuba diving sites based on our 33 years of practical diving and dive boat operations in the Whitsunday islands. Tidal movement has the greatest effect on underwater visibility in the Whitsundays. Try to plan your dive so that tidal flow is least. Western side of Hayman Island. About 19 metres max depth. Top dive site and good snorkelling. Manta rays and giant maori wrasse often seen here. Visibility is affected by northerly winds. Features small valleys, drop -off, gullies, tunnels and overhang. Great display of gorgonia, fans and staghorn corals with some plates. Coral trout under plates, slatey bream and red emperor. Northern tip of Hayman Island. Calm weather dive only. 18 metres max depth. Huge boulders on the sloping seabed make this an interesting dive. Large coral bommies (20ft to 50ft). White tip reef sharks and hammerheads often seen here. Pelagics such as tuna, mackeral and barracuda are often seen here. Western side of Langford Reef. Very exposed and not often diveable. Good dive in calm conditions. Features gullies, swim throughs caves and overhangs. Beware of cone shells here and on Langford Reef. Safe, shallow dive to 10 metres. A finger of reef extends in north westerly direction form the southern corner of Stonehaven anchorage. A great single vessel anchorage exists between Eaglehawk and the southern shore and snorkelling and scuba diving are good if conditions are right. Fine sediment is in abundance here and the dive can be quite murky if the current is running. However, visibility can be over 60ft in calm conditions. Features soft corals, nudibranchts and sea anenomes. Northern end of Hook Island. Named after the coral species found here. Large coral bommies with lots of territorial sea creatures. Bommies rise up from about 13 metres but the tops are well clear of the surface making the site unsuitable for snorkellers. Gullies and ledges in deeper water. Some plate coral. Trout country. Another top dive and usually good unless in a northerly. North East tip of Hook Island. Good diving and snorkelling. Best in a light south easterly. Fairly exposed anchorage. Not good in northerly winds. Fabulous coral on big bommies that rise from 65ft to within 5 or 6 feet of the surface. Big manta rays and maori wrasse seen frequently with white and black tip reef sharks. Great dive but not for the faint hearted. Northeast tip of Hook Island.